Today was some work, some play, but all in all, a very nice day. I finished up a customer quilt. Lots of laundry done. I played with my embroidery machine a bit. 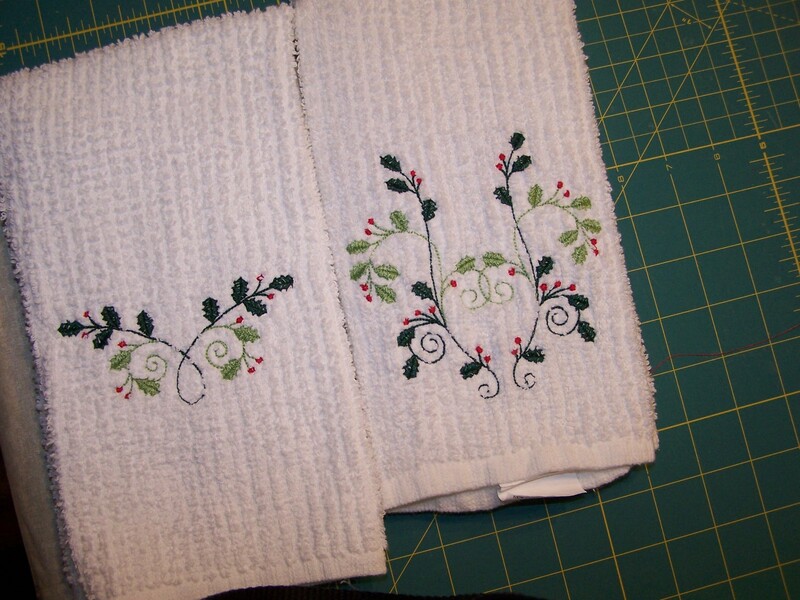 I wanted to try Christmas embroidery on some kitchen towels. I used a heavy cut away stabilizer, and a wash away stabilizer on top, as is recommended…and they are ok, but nothing awesome. I don’t like how you can see white spots in the green leaves, but I don’t know what you can do about that. I finally got around to fixing my binding booboo on my Gracie’s Star quilt, too. Now I can get back to the hand stitching, and have a finish soon. I really love that quilt. Gotta go hang up laundry! And cheer for the Longhorns!